Please don't let this thread devolve into a discussion of US policy. Can we keep that thread on the rails and you can discuss it here? Deleted post shows up on Front Page shadowed out. Cool. Is this only visible to the original poster, or for the OP and anyone who made a comment in the thread? Thanks. Paris meetup Dec 5, oui? Apparently, Jesus *wouldn't* enjoy Dora the Explorer. As I made some final revisions and edits to my most recent metafilter post, I came across something peculiar. I took a screenshot to explain. 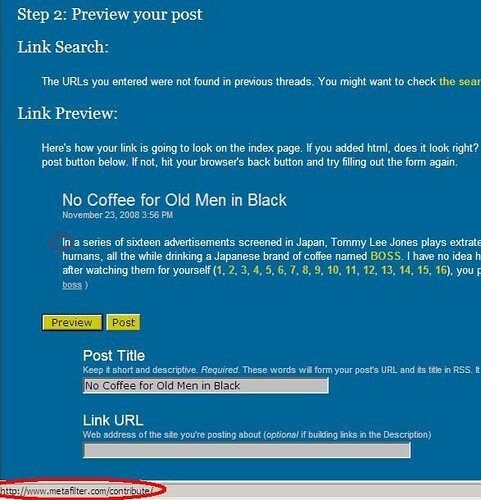 When I hovered my mouse over the letter I from the word 'In' at the very start of my post, it offered a link to this page (see the link circled at the bottom of the picture), even though I hadn't actually created a hyperlink to it. If I directly clicked the I, it would take me to the page. If I tried to open it in a new tab, it didn't work. It was still there even after a refresh. Is this happening to anyone else? I'm using Internet Explorer 7, if that helps. Scrabble Breakup Video...where is it? Privacy concerns for social networks*fnord* ? PonyFilter: Keyboard navigation for comments, similar to what's demonstrated here, except the pagination hack wouldn't be necessary (unless you wanted it to go to the next thread instead of the next page). 'j' would go one comment down the page and 'k' would go one comment up the page. It'd be a real nice addition! Pony: Unless I'm wrong, it seems that inclusion on the 'popular posts' page/rss feed is limited to highly favorited threads. Can we get threads with a lot of comments included on that page/feed as well, even if they don't have a lot of favorites? Or a separate page for that sort of thing? Coincidence?? or "Behold My Power"
We have a most favorites. Can we get a most favorited comments on the green, or am I just missing it? Is there a CBT solution for this problem? Where are the interesting indie people in HK? Why doesn't the Metafilter search also look through deletedthread to find duplicates? Whenever I preview a post—at least on the front page and MeTa—any &langs in my links became 〈. I'll go first: How's this not chatfilter? Mini MeFi Meetup for dinner at Talula's Table? Unicode? What, is that like a unisex haircut? Philly + cupcakes = awesome. Could we get an email when one of our posts is deleted? Who has the most favorited comment? It's possible to find the most favorited post of all time but is it possible to find the most favorited comment of all time? Or a ranking system that does something similar to the post system (week, 30 days, all time) for comments? I just noticed a little AJAXified link on the sidebar to show Contact Activity. Is this something new, or am I tripping? Can I use Projects to help with a non-web, ultimately personal, project? Right this very moment, Cortex is sitting at home, sans-pants, watching the flag queue, poised with the ban-hammer, bemoaning his utter lack of head-sized doughnuts. Welcome to the Land of the Lost Full-Time MetaFilter Admins, Cortex! Congratulations to Mefite Eric Gjerde, whose website was the subject of a previous FFP, on the publication of his new book. slash the slash or drop the slash? About my last post, Mea Culpa, no excuses, just stupidity. Senses back. Metafilter should have stupidity check system. What's the best time of day to post to AskMe? How about a meetup to celebrate both Obama's victory and the historic shift of Indiana to the Blue column, the first time since 1964? I'm stoked and happy, and I'm sure a few others are as well. Let's celebrate! Spammer? 3 answers in one day, to old questions, with self links. plexi's post has images. Is there a "bank" of images we can use, image tags are now allowable, or was this inserted by a privileged person? Who's broken? Metafilter or me? Not fantasy sports - fantasy movies! I know that "this will wendell" is a (facetious) pun on "this will end well", but what's the origin and significance of this MeFi in-joke?